The Department of Tourism and Leisure’s Heritage Railways is pleased to announce an increase in the number of passengers travelling on both the steam and electric railways during 2007. The Isle of Man has the longest narrow gauge heritage steam railway in Britain and the scenic line chalked up 109,069 passengers last year, as opposed to 101,837 passengers over the same period in 2006, showing an increase of 7.1%. Passing through some of the Island’s most delightful rural scenery, the Manx Electric Railway prides itself on the quality of its heritage experience and literally transporting visitors back in time to the heyday of tourism. The MER carried 78,665 passengers in 2007, as opposed to 71,567 passengers over the same period in 2006, showing an increase of 9.9%. ‘We are obviously pleased that 2007 has been a very good year for us. Throughout the year, we have sought to broaden the Isle of Man railway’s nostalgic appeal to visitors of all ages but also actively marketed the railway as one of the best ways for people to see the countryside. The Santa trains also proved extremely popular during December, carrying over 1900 people and with passenger numbers up in 2007, the Department of Tourism and Leisure is looking forward to another record breaking year in 2008. 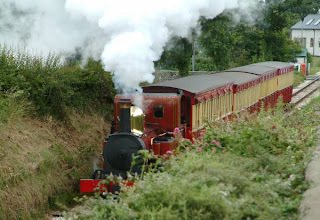 The Isle of Man Railway is the longest narrow gauge steam railway in Britain stretching 15.5 miles. The first train ran on July 1st 1873. 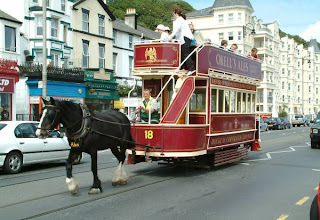 The Manx Electric Railway started in 1893 and the Snaefell Mountain Railway in 1895. ‹ The Story of the Bollan Vane, courtesy of the World Manx Association tent at Tynwald.